You've found the “U.S. Wensleydale Sheep Breeders” page here at Hobby Farm Wisdom! If this is the first time you have visited our site: Welcome! Wensleydale is an English breed of domestic sheep that is native to the Wensleydale region of North Yorkshire. They were developed by crossing English Leicester with Teeswater sheep. Wensleydale is one of the largest and heaviest sheep breeds and is primarily used as a ram breed to cross with other breeds. This breed has a uniquely blue-grey face, ears and legs. Their ears are elongated and stand straight up from the head. The wool from this long wool breed is considered to be the finest lustre long wool in the world and if taken from a purebred Wensleydale, it is kemp free and curled to the end. 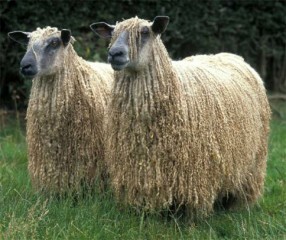 Wensleydale sheep have a tuft of long wool on the top of their head and are naturally polled. While most popular in the United Kingdom, Wensleydale sheep are spreading into Europe and North America as well.